ORGANIZERS: Richard B. Buxton, Ph.D., Karla L. Miller, Ph.D., Benedikt A. Poser, Ph.D., Rishma Vidyasagar, Ph.D. & Ed X. Wu, Ph.D. Novel techniques for precise and specific stimulation of the brain are rapidly growing in sophistication. A multimodal approach combining these methods in a synegistic way with fMRI methods has the potential to provide both novel insights into neurophysiology and establish a physiological foundation for interpreting fMRI results in human studies. Physicians and scientists engaged in basic neurophysiology and disease model research; Physicians and scientists wanting to understand the potential and limitations of a growing field. -Describe the challenges involved in interpreting multimodal measurements. The BRAIN Initiative targets a wide range of tools for sensing, tagging, and manipulation of multiple electrical, molecular/chemical, and connectivity parameters in the working brain. Combining these tools with fMRI measurements may accelerate our progress towards understanding the brain function in health and disease, open new avenues to guide the development of treatments, and build a stronger physiological foundation for human noninvasive imaging. Notable examples of the combined use of optogenetics an fMRI (i.e. “opto-fMRI”) have been recently published, revealing the possibility to map the brainwide substrates modulated by focal neuronal population. 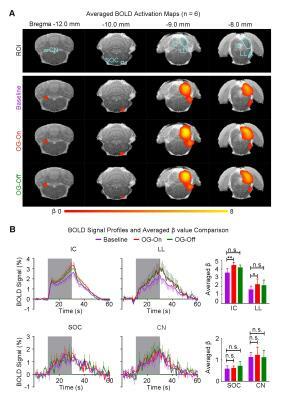 However, opto-fMRI is complicated by the use of invasive cranial implants, and the need to control the insidious contribution of heat-induced hemodynamic–responses. Here we show that “chemo-fMRI”, e.g. the combined us of DREADD-based chemogenetics and fMRI, permits to overcome these limitations, by enabling non invasive brainwide mapping of tonically-stimulated neuromodulatory systems. Chemo-fMRI mapping of serotonin-producing neurons is described as an illustrative example of the power of this novel investigational approach. Spatial selectivity is of high importance for Deep Brain Stimulation (DBS). Here we used BOLD fMRI to demonstrate for the first time that axon-orientation selective stimulation can be achieved in the rat’s corpus callosum by steering the stimulus phase of the independently driven channels in a tripolar DBS electrode. Pronounced angular dependence of the BOLD fMRI on the orientation of electric field gradient was detected. As expected based on simulations, the maximal (or minimal) BOLD response was observed when the induced dipole field was parallel (or perpendicular) to the axonal tract, respectively. Here we present a novel approach to non-invasive neuromodulation that affects neuronal activity by delivering neurotransmitter chemicals to targeted areas of the brain. This is achieved by using focused ultrasound to transiently open the blood-brain barrier in a targeted brain region such that a systemically injected neuroactive chemical such as GABA or glutamate will leak out of the vessels and into the brain parenchyma only at the intended site. 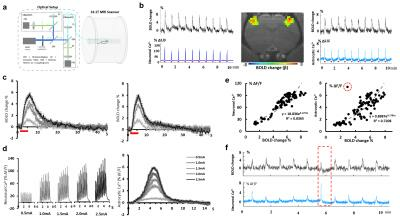 We demonstrate the proof of concept in a rodent model by delivering GABA to the somatosensory cortex to suppress activation from hindpaw stimulation. Brain-wide cross-modal interactions are important for building an accurate perception of the external world. Yet, whether and how somatosensory inputs influence the auditory processing remains unclear. Our recent study showed that low frequency optogenetic stimulation of somatosensory thalamus induced activation in auditory cortex (AC), but did not explore the functional effects on auditory system. This study investigated whether propagation of low frequency inputs from somatosensory system influences auditory processing. The results demonstrated that low frequency long-range propagation from somatosensory system enhanced auditory responses in most auditory structures, including lateral lemniscus, inferior colliculus, medial geniculate body and AC. Neurovascular coupling is the basis of the BOLD fMRI, however, the mechanisms of the neurovascular coupling remains elusive. By simultaneous cell-type specific Ca2+ recording with BOLD fMRI, it allowed us to study the cellular specific coupling events through the neuron-glia-vessel network. This work showed neuronal Ca2+ and evoked astrocytic Ca2+ signal were positively correlated to the fMRI signal, but an intrinsic astrocytic Ca2+ signal was negatively correlated to the fMRI signal in the cortex. It indicated a novel neuron-glia-vascular coupling event mediated through the intrinsic astrocytic calcium signal (details mechanistic study in another abstract: ID 4475).